Here Comes Peter Cottontail, hopping down the bunny trail. Hippity, hoppity, Easter's on its way . 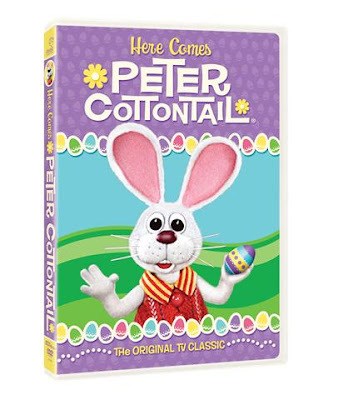 . .
Now you can own the original tv classic Here Comes Peter Cottontail on dvd. holidays to deliver the most eggs . . . and save Easter for children everywhere! It's exciting to see these old classic movies on dvd so that our children can enjoy them like we did as children. Since this movie came in the mail last week, my kids have been asking repeatedly to watch it. The suggested retail price of this dvd is $9.93 and it can also be purchased on iTunes for $7.99. 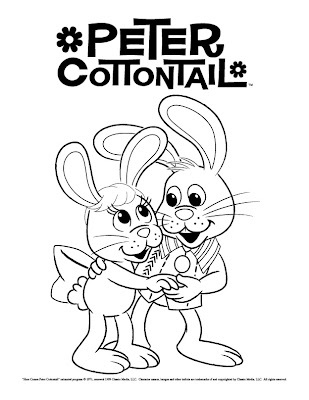 I have some super cute coloring pages that you can print out. Just click on the image to enlarge it for printing. And now for the giveaway . . . 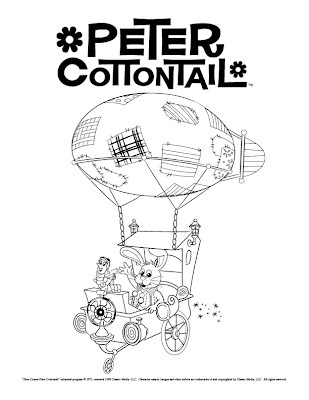 I have TWO copies of Here Comes Peter Cottontail for two of our readers. To enter, you can leave a comment. You can also earn additional entries by tweeting this giveaway, following me on twitter, blogging about this contest, etc. You can use this shortened url when tweeting the article, http://tinyurl.com/yzk39ea. Just please leave a comment for each additional thing that you do. It just makes it easier to count entries. This contest will end on Monday, March 29, 2010. The winners will be chosen using the random number generator and will be contacted by email. Winners will have 72 hours to respond or another winner will be chosen. Disclaimer: I received a copy of this dvd for review purposes. i would love to have this book for my 17-month-old this easter. so special. Oh how fun! My 2 year old would love this. This would be great for the grandchildren. I hope to win for our little one. This is my favorite easter cartoon. I would love to give this to my son. I'd love to watch this movie with my 2 kiddies, thanks! Easter is my favorite holiday. I would love to have this for my new grandbaby. I would give this to my daughter! Thanks for the chance. I would love a chance to win this for my niece. Thank you. This is so cute, my kids would love it! I would love to have this book for my 4 year-old grandson! I would love to have this to put in my grandson's Easter Basket! How fun! I think my nieces & nephew would love this! I can't wait until my 2 grand daughters come over for Easter. Thanks for the great giveaway and the coloring sheets! I would love this for easter. 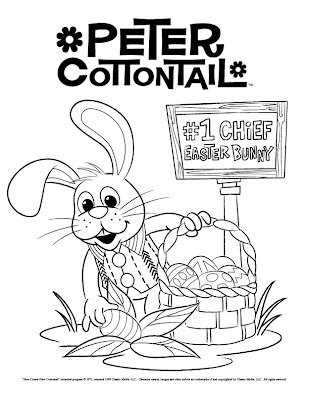 This was a childhood favorite of mine and I always looked forward to seeing it on TV every Easter season. I would love to share this holiday magic with my little nephews. Thank you for the chance to win. My daughter would love to watch this. She loves bunnies and this will be the first Easter she will know what's going on. What a fun Easter movie. Would love to have it! We saw the Easter bunny this weekend. The kids are so excited to have him visit the house next weekend. Great giveaway! This would be a great classic to have for the kids. I was just searching the tivo to see if this video was going to be playing this week. So wanted the kids to see it but couldn't find it. What a cute movie, I'd love to be able to share it with my children :D I remember it from many years ago and it just doesn't seem like Easter if I don't get to see it! my son would love it. too cute. my daughter would love this.thanks. I have a little grandson who loves rabbits and this would be ideal for him. Thanks for a great giveaway! Aww I would love to win this for my daughter. Our Easter plans are not going as planned so I think this would brighten her day. I always LOVED this movie! Thanks for the giveaway! Please enter me in the contest! Thank you.